Did you attend the Surfaces '09 General Session Industry Wake Up Call? The one that brought together 6 flooring industry leaders in a first of its kind event to have a conversation? Yes, a conversation about the tumultuous times we're in, how floor covering industry leaders have reacted, and where they see things headed. It's the same conversation that sets the stage for Floor Covering Institute insights. The event, titled "Prevailing Through the Current Crisis - An Industry Wake-Up Call," attracted a record 1000+ attendees representing the flooring industry. I was fortunate to be one of them and I found the event amazing from multiple perspectives. First, the participants: Ralph Boe, president and CEO of Beaulieu of America; Rainer Blair, then CEO of Mapei of Americas; Tom Davis, president and CEO of Mannington Mills; Tom Lape, president of Mohawk Residential; Randy Merritt, president of Shaw Industries; Frank Ready, CEO of Armstrong's North American flooring business. They represented a range of flooring related products and both domestic and international perspectives. Second, the moderator: Gerri Willlis of CNN fame. Third, the format: an informal panel discussion focused on the flooring industry, with major flooring industry leaders, and open to questions from the audience. Yes, some topics like pricing weren't discussed. That's by law [i.e., the Sherman Anti-Trust Act], but also, in my mind, irrelevant given the broad and intense nature of the change affecting the flooring industry. Much better given the one-of-a-kind nature of the event to focus on the big picture rather than minute details! The amazing aspects, though, went further. After all, how often do top flooring industry leaders come together onto a stage in a public forum? To openly, with respect for one another, discuss the industry as it faces its greatest challenge and take questions from the audience? Yet, had it not been for two insightful flooring individuals, Floor Covering Institute's Jim Gould and Affluent Insights' Chris Ramey [also of Floor Covering Institute fame], who sponsored the event, I doubt it would ever have happened. You see, observing that the only time the industry hears floor covering leaders is at company-sponsored conventions, they identified the need to hear the industry leadership in an open and public forum, speaking on a realistic basis and discussing where they thought the world was headed. And, what better time than at THE flooring industry trade conference, Surfaces, to hear them in a relaxed, approachable forum with Gerri Willis moderating. After all, if something happens in the industry, these are the leaders who make it happen. Chris and Jim wanted proceeds from the event to benefit the Floor Covering Industry Foundation [FCIF- here's a link to a previous post about it]. By the way, did you know that Gerri Willis was impressed with the Foundation? She said that flooring was the only industry outside of Hollywood that had such a fund to support its own members. At the time, I was still employed by Solutia, then a carpet fiber manufacturer. My brand had just been sold to Mohawk and my division was soon to be sold to a private equity firm. I witnessed the Wake Up call understanding the issues and implications for survival. I appreciated the participants' candor. I found fascinating that each approached challenges differently, while remaining focused on what mattered, staying positive and not compromising on what's important to customers. Read for yourself FCN's article titled "Industry Leaders Discuss Economy." Eight months later, our industry continues to weather the storm. We may soon see signs of life, albeit in a radically redefined marketplace. Given the Wake Up call and who was behind its genesis, I appreciate even more intensely the insights that the Floor Covering Institute shares with the industry here via this blog. More specifically, Stuart Hirschhorn anticipates improvement in the residential replacement marketing in 2010. Chris Ramey urges innovative strategies to survive the New Normal and the radical changes in carpet, housing and the flooring replacement cycle. Jim Gould details global implications for the flooring industry -- from the Lacey Act to China. David Wootton shares what the future looks like given the past 20 years in flooring. And, I'm very conscious that consumers are in control of the marketplace and that they expect more than ever from the companies they purchase from and align themselves with. What do you think of the Flooring Industry Wake Up Call? And, what are you doing differently as a result? It never ceases to amaze me that there are people selling floor covering that do not understand the product. This goes for retailers, contract dealers, architects, designers and specifiers. Having the opportunity to see literally thousands of flooring failures over the last 38 years and still seeing the same thing occur can be very frustrating. A large percentage of the failures have are due to somebody not knowing, and sometimes not caring, whether the flooring material will actually do what is expected of it. Instead it’s more important that it look good or go with the décor. The wrong product in the wrong place is a formula for disaster and, unquestionably, failure. You can’t think something will work and then be surprised when it doesn’t if you really don’t know whether it will or won’t in the first place. Here are just a few tips to keep you out of trouble. Light colors soil more than dark colors and using a light color in a high traffic area will cause the material to ugly out very quickly. For example, a recent installation on five floors in a corporate environment of a very light colored beige carpet that has coffee, beverage and food spills all over. This carpet will be a maintenance nightmare. It’s brand new, very expensive and was supposed to make a statement. Cut pile carpets will mat and crush and show traffic patterns. If you don’t want the traffic pattern to show you have to sell or specify carpet that is low, dense and loop pile. Cut and loop or tip sheared carpet with a high percentage of tip shear will cause the pattern in the carpet to wash out over time. This is a common problem in hospitality carpets. For example, a tip sheared carpet (cut and loop) in the corridors of a new hotel generated a complaint for appearance retention – it didn’t look the way it did when first installed. Tip sheared yarn blossoms to reflect light differently than the adjoining loop creating a contrast pattern. But the tip shear has less resiliency and over time will mat and crush causing the contrast pattern to wash out. This is a common problem I am called to assess in the hospitality industry. Using the wrong fiber will also cause problems. For example, polypropylene has no inherent resiliency; it will mat and crush and it will never come back up. If this type of carpet is sold into a high traffic environment, residential or commercial, you can expect complaints. It has many positive characteristics but resiliency is not one of them. Remember this - there’s a product that will work for every application; you just have to know what that product is and as flooring industry professionals that is expected of you. If you don’t know or need help call me; we know what will and won’t work, why and what you should use to stay out of trouble. This is not the type of economy where you can afford to make mistakes. I invite your comments and discuss here or email me at lgmtcs@oplink.us. Lew Migliore is a consultant with the Floor Covering Institute, President of technical consulting firm LGM and Associates, author of “The Claims File” appearing regularly in Floor covering News and the Commercial Flooring Report, a national publication focused on the state of the commercial flooring industry. Some people call Lew the "godfather of claims”. Flooring Industry Take Note: Will carpet return when "normal" returns? and...What if the new "normal" is already here? Perhaps you’ve heard about the new normal. Essentially the question for all business people is what will business be like when it “returns.” Those in the flooring industry may have more to fear than most. The new normal - the landscape to which we will manage our businesses - will be far different from before the housing implosion. It’s particularly bothersome because the floor covering business has been so bad for so long. What if we discover we’re already experiencing the new normal? The explosion of hard surface over the last decade will interrupt the normal replacement cycle of flooring. The facts are carpet has been declining in units for many years. According to Catalina Reports, 2004 was the year that carpet and rugs as a category experienced their biggest year in units; long before housing started to tank. If 2010 is as troubled as economists are suggesting, unit sales of carpet may be substantially less than half the unit sales in 2004. Half is a monumental and unprecedented drop in units. No one can blame that merely on the economy. The facts are that consumers no longer desire carpeting throughout their home, and the more affluent the consumer the less likely they want it even in their home. These pesky facts have often been masked by price increases. Perhaps you’re one of those whose carpet sales grew through 2007 and were laying off installers at the same time. During the decade of the 1970s we used to advocate wood or ceramic in the entrance of a home to protect the carpet. Back then we even had displays of kitchen carpet; yes, it really was that ugly. Then, in the 1990s we advocated hard surface in the living room whilst carpet was the fait accompli in the bedrooms. Not anymore. Carpet is often the step-down for the bedrooms and it serves to tell your friends that you couldn’t afford hard surface. Shaw Industries knew what was happening when they promoted carpet for the garage. Who’d have thought that the garage would be the only room in the house where installing carpet made it a more luxurious room? Even further, who’d have the thought the garage could be a room? The second not necessarily good news is that new construction isn’t coming back anytime soon and contract/commercial will be dead for a few more years too. If either category is your primary business then you’re probably out of business, considering going out of business or quickly changing your business. If not the first two then you probably should consider the third. When new construction returns the greatest beneficiary will be hard surface. Builders believe, and customers often think, that carpet is one of the products that helps define an inexpensive home. Builders aren’t generally known for sophistication. But they understand that upgrading a laminate counter top to granite makes an impact on the consumer. Builders don’t understand upgrading from 25 oz nylon to 40 oz polyester when most customers can’t tell the difference. If you’re like most independent flooring retailers you live in the same community as your store. You know your customers; perhaps your children went to school together, you patronize their businesses, socialize with them, serve on the same philanthropic committees, etc. They’re loyal to you and you’re loyal to them. You probably prefer to eat at their restaurant rather than the chain down the street because the money stays in your community. You likely socialize with your customers because you share a common goal of creating a better community. And, you probably sold them the ceramic or stone for their home that still looks gorgeous twelve years later. Gosh, no wonder they like you so much. After all, you sold them a product that they’ll never have to replace. Good for them; very bad for you. In harsh terms; selling a product that renders you irrelevant (defined as not needing your products any more) is analogous to a restaurateur serving you poison. In either case your business relationship is irrelevant and you’re bound to die. Finding new products that will permit you to make enough money to be satisfied. The new normal is likely here. It’s time to accept this may be as good as it gets. Part 2. In part one of my post I wrote about the last 20 years in the floor covering industry. Today I talk about the future. So what does the future hold for our industry? Obviously, until we experience a significant improvement in the economy and the banks start lending money (sensibly) life in our industry will continue to be difficult. There is currently way too much production capacity in all segments. It is going to be a long time (if ever) before new home construction returns to the heady levels of 2007 and earlier. On a brighter note, another Floor Covering Institute colleague, Stuart Hirschhorn, who publishes the excellent Catalina statistical reports, suggests the current improvement in existing home sales should lead to an improvement in the residential remodel business in 2010. Here is what I expect to see in the next few years and remember this is only my opinion for what it’s worth. Dal Tile (ceramic), Unilin (laminate), Columbia (hardwood) and their strategic alliance with Congoleum. Armstrong, following their very interesting strategic alliance with Beaulieu Carpet can do the same and with the exception of vinyl so can Shaw.I expect to see these companies fighting for the much sought after builder business and dominating the market. Mannington is another excellent company and I believe it will continue to champion the independent retailers through the “one Mannington concept”. Elsewhere, I believe consolidation through acquisitions will continue and the resulting synergies will benefit those companies while other manufacturers will pursue the niche markets. Given the current weak dollar, manufacturers will no doubt continue to look to expand into global markets. Through Unilin, Mohawk already has a substantial global presence and Mannington has an interesting strategic alliance with a major Chinese manufacturer. Distributors will be concerned about the large manufacturers by-passing distribution and selling all their product ranges and brands direct to retailers. More dual distribution is also a possibility. Others will consolidate through acquisition and some will close. I believe there will always be opportunities for well run distributors to thrive provided they manage their finances in a professional manner. I also expect to see more distributors launching their own private label programs to protect their interests and reduce their reliance on existing branded products. At retail I believe more independents will close and the retail cooperatives will continue to grow in importance including develoing private label programs. Big boxes are a fact of life and will continue to be a significant force in the market. In terms of product assortment hard surface will continue to achieve growth at the expense of soft surface and environmentally friendly products will be a must, although they might not command a higher price. Can you continue to stand alone or do you need to be acquired by another company or form a strategic alliance to enable you to operate more effectively? How does your balance sheet look? Will you collect all outstanding receivables and is your inventory valued correctly given its aging? If the answer to these questions is no, what impact will this have on cash flow and can you take the hit? Can you eliminate any overhead; do you have the right people in the right positions? Then prepare a plan together with your key people; share it with all employees, and most importantly monitor the plan and continuously refine it as market conditions change. Finally, if any of you would like to discuss your current situation with someone who has experienced the good, the bad and the ugly sides of our industry feel free to contact me at david@thewoottongroup.com. I cannot promise to be around for the next 20 years but I guarantee the flooring industry will be! As always, if you have, thanks for reading. 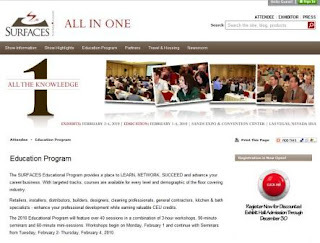 Surfaces 2010 is coming right up - Monday, February 1 through Thursday February 4, 2010 at the Sands Expo & Convention Center in Las Vegas - and four Floor Covering Institute consultants will hold six education sessions at Surfaces 2010. Since you don't want to miss these sessions, I want to make sure that their combined schedule is available to you. All of the sessions are designed to provide up to date, practical information to apply to your business. Institute President Jim Gould will host a panel to provide insight and instructions important to anyone thinking of developing an import program including guidelines for importing under the provisions of the Lacey Act. The session is geared towards foreign manufacturers considering exporting to the U.S. and domestic buyers wishing to learn about importing. Christine Whittemore will hold two sessions; one on marketing in a recession and a second will provide an overview of social marketing and how to apply it in your business. Christopher Ramey will cover new selling tactics and strategies necessary for marketing to post-recession consumers. Lew Migliore will hold two sessions; his annual program on installations will provide an update on the latest information techniques and his second will focus on how to keep poor installations from ruining a sale and draining your profits. Check out their schedules below! Christine Whittemore. Ms. Whittemore is Chief Simplifier of Simple Marketing Now, and a marketing expert with 16 years experience in the floor covering, home furnishings and apparel industries. Three dynamic marketers present a marketing 'how to' unlike any other when they help a fictitious retailer solve problems and apply marketing tools. Learn how to make the most of your marketing dollars in a down economy and how to use social marketing to connect with your customers in new and meaningful ways. Join Christine Whittemore, Scott Perron of Big Bob's of America and Paul Friederischsen from Brand Biz, Inc. for an informative and undoubtedly entertaining three hours. For additional perspective, read through the posts Christine has written about this session on the Simple Marketing Blog or listen as the panel previews this session on Talk Floor. Tuesday, February 2, 2010 -- 12 noon to 1 p.m. Confused about all that Twitter, Face Book and social media talk? Then this session is for you. It offers an overview of social media - what it is and why it matters - how to apply social media tools for your business, better understand the marketplace, promote yourself and connect with customers. We'll examine Google, Face Book, Twitter and blogs to 'listen' to the conversations taking place and enable you to eventually become more actively involved. In other words, practical and actionable social media knowledge! Jim Gould. Mr. Gould is President of the Floor Covering Institute and a 40 year veteran of the floor covering industry who has imported flooring for his businesses, established CCA's direct import flooring division, Global Direct, and now helps companies to evaluate and execute business strategies including importing. "Avoiding Landmines in Flooring Imports"
Wednesday, February 3rd -- Noon to 1 p.m. Importing directly is a business tool that retailers, distributors and buying groups can use to increase their product offerings and boost profit margins. You don't have to be a huge company to employ this strategy. This session is geared toward both foreign manufacturers wishing to export to the U.S. and domestic buyers wishing to import. We'll help you decide if exporting/importing is right for you and help you implement a program that avoids the perils that can lurk in the unknown - aka "landmines". We'll cover an array of topics including new standards for importing wood under the Lacey Act Amendments, dispute resolution, payment options, insurance, documentation, quality control and inspections, duties, customs and more. Join us and find out how to import on your own! Lew Migliore. Mr. Migliore is President of LGM and Associates, a technical consulting firm specializing in all aspects of product and installation performance and education. 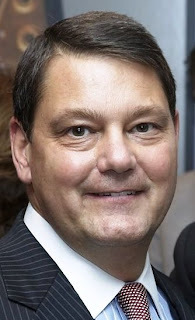 He is author of "The Claims File" appearing regularly in Floor Covering News, author of The Commercial Flooring Report and is considered to be one of the industry's most respected independent analysts of flooring complaints. "Flooring Installation -What You Don't Know Will Hurt You"
Wednesday, February 3rd -- 8 to 9:30 a.m.
Poor installation can ruin a sale, a product and drain profits - learn how to prevent this from happening! New products, technologies, installation methods and means are the fastest changing part of the industry. understand how the new installation standards and warranties that come with them will affect you. What you don't know will hurt you! "Common Causes and Corrections for Installation Failures"
A core annual program featuring updated information to give you the latest industry information and installation technique ideas. To get the most from this program, bring your most challenging questions! Christopher Ramey. Mr. Ramey is President of Affluent Insights and has 30 of executive management experience in the flooring industry. He provides a unique perspective for retailers and manufacturers as he breaks down the market place and helps retailers and manufacturers connect with and market to various consumer segments. In this workshop he focuses on the post-recession consumer. Monday, February 1st -- 1 p.m. to 4 p.m. Selling to the post-recession consumer requires new selling strategies and new tactics to be successful. This hands-on workshop will review the changes, challenges and opportunities for succeeding in 2010 and beyond. You'll learn the new consumer mindset along with strategies and tactics necessary to sell more products, more often and more profitably. While writing my introductory blog post a couple of weeks ago I began one paragraph by saying “In 1990 I relocated with my family to Johnson City, Tennessee.” This reminded me that I will enter my 20th year in the floor covering industry at the end of this month. What better time to reflect on how it was, how it is, and how I think it might be in the future. Much has changed in the past 20 years in terms of product assortment, manufacturers, distributors, retailers, channels and the move in consumer preference from soft to hard surfaces. Oh, and by the way, did I mention we are currently experiencing the worst market conditions ever? So who were the major players in 1990 when manufacturers tended to concentrate on just one product segment; either carpet, vinyl, hardwood or ceramic? In carpet Shaw was the dominant name having recently acquired Armstrong’s carpet business. Elsewhere in the carpet segment consolidation was the name of the game with acquisitions happening on a seemingly weekly basis. Today’s giants are Shaw and Mohawk with Beaulieu completing the picture. Interestingly, carpet has not been adversely impacted by imported products and its overall market share, which had fallen as consumer preference shifted to more hard surface products, appears now to have stabilized somewhat as consumers trend towards lower priced products. In vinyl there were four major names: Armstrong, Congoleum, Mannington and Tarkett. The big four are the same today despite asbestos litigation, and until recently falling market share (due in no small part to the growth in laminate flooring). Product quality, color and design are at an all time high. Like carpet, vinyl is increasing market share as consumers return to lower priced products. In hardwood the 1990 product assortment was 80% unfinished oak strip with the balance being largely parquet - a product that is becoming increasingly difficult to find today. Prefinished products were in their infancy. Engineered products held around 1% of the market. Imported products were dismissed as inferior and made from undesirable species. The giant at the time was Bruce Hardwood Floors (Triangle Pacific) with around 50% market share and in the early 90s there was daily speculation about their future. By the mid 90s, its impressive CEO, Floyd Sherman, had taken Bruce public and acquired its largest competitors, Hartco and Robbins. Bruce was then acquired by Armstrong. In these 20 years the hardwood market has more than doubled with major growth coming from the introduction of engineered prefinished flooring - which now accounts for 50%of the market. The overall quality and durability of the finish has improved and there are now a wide variety of products available in many different species and stains. Twenty years ago hardwood flooring was sold by specialty hardwood retailers and installation companies; now it’s sold by full-line floor covering stores. Skilled craftsmen were needed to sand, stain and seal solid unfinished flooring; now all flooring installers can install engineered and solid prefinished hardwood floors. Armstrong continues to be the market leader but Mohawk and Shaw are catching up; Mohawk, as a result of the Columbia acquisition, and Shaw, as a result of the Anderson and Zickgraf acquisitions as well as their own investment in a plant. Mannington and Mullican are the other major domestic players. Imports have had a major impact on this segment, acquiring I believe, around a 20% market share. Their success has been due to improved quality and logistics, attractive pricing and access to exotic species - although the Lacey Act is causing them a few concerns at present. The unfinished flooring manufacturers are still in business but have and will continue to be badly hurt by the decline in new home construction. The introduction of “clic” installation as well as the environmental benefits of engineered flooring mean this product is the future of the hardwood segment. In the 90s, ceramic was, and still is, a very fragmented product segment. Mohawk dominates now due to their acquisition of Dal-Tile, which is the largest domestic producer and for a long while the only producer with national logistics capability that could deliver ceramic cost effectively. Imports make up the balance of the market. I hear you asking, “What about laminate?” In 1990, laminate flooring was not even a category in the U.S. It was not until my Floor Covering Institute colleague, Jim Gould, discovered Pergo in Europe and introduced it to the U.S. market that its phenomenal growth began. Today it is firmly established and at a point where growth has slowed as the category moves towards maturity. There are many players in the laminate market although U.S. manufacturers are now the market leaders: Mohawk through their acquisition of the Unilin/Quickstep operation, Pergo, Shaw Mannington, Wilsonart and Kronotex. Armstrong is also a major supplier of laminate although its product assortment is outsourced. The distributor landscape in 1990 was very different from today. As a result of the trend by manufacturers to sell carpet direct to retailers, distributors were generally categorized by which brand of vinyl they carried. Few carried hardwood or ceramic which were left to specialty distributors. Many names are gone by choice, acquisition, financial failure or manufacturers withdrawing support. L.D. Brinkman, Rubin Brothers, Hoboken, Misco Shawnee, Vollker and La Salle Dietch were among “industry powerhouses” who exist no longer. The seemingly continuous refinement of the Armstrong distribution network also played its part. 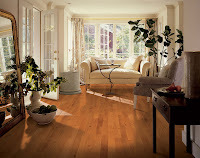 Eventually a majority of distributors added hardwood flooring, ceramic and laminate to their product assortment and some formed strategic alliances with foreign exporters wanting to sell their products into the U.S. market. The big names today include J.J.Haines, All-Tile, Florstar, BPI, Readers, Longust and Galleher. 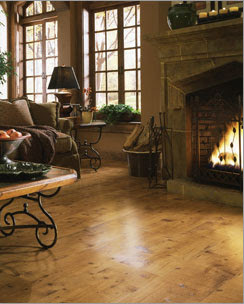 Specialty hardwood, ceramic and accessory distributors also continue to operate. The ill fated purchase (and subsequent sale) of New York Carpet World, Carpetland, and Dupont Flooring Systems by Shaw, the demise of the Color Tile empire and closure of several prominent independent retail outlets changed the face of retail at the midpoint. On a more positive note, the growth in “buying groups,” or “retail cooperatives” as they now prefer to be called, has exploded with CCA Global attracting a very impressive membership network prized by all manufacturers. Home Depot and Lowes have eliminated most large chains with the notable exception of the mid-west giant Menards. The majority of these organizations deal directly with the manufacturers and import themselves, with distributors supplying logistics training and the credit functions in some cases. So that’s my recollection of what has happened in our industry during the 20 years I have been involved. It’s pretty interesting and some of us even find it exciting! Stay tuned for Part 2 and my thoughts about the future. I'd love to hear your thoughts. Part 1 of this post - Stuart Hirschhorn: Residential Flooring Replacement Sales May Rise in 2010 - appeared on Tuesday, October 6, 2009. 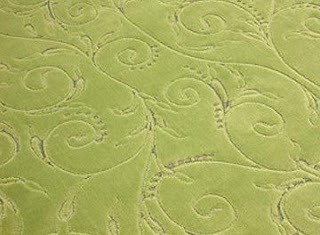 Both posts include excerpts from the September 2009 Catalina Floor Coverings Quarterly Update. Mr. Hirschhorn is the director of Research for Catalina Research and a consultant with the Floor Covering Institute. In Part 1 of my post earlier this week I reported on the state of the flooring industry - that we estimate existing home sales may rise by 4.8% in the third quarter of 2009 over the same period the previous year. This compares to a 2.8% drop in the second quarter, a 7.4% decrease in the first quarter and a 13.1% decline for all of 2008. Based on the improvement in existing home sales this quarter, Catalina estimates that total floor coverings square foot sales could decline by 10.0% during the fourth quarter of 2009 (see chart in previous post). This is a one-third improvement from the decline in the second and third quarters and only about half the decline in the first quarter. This better performance reflects the expectation that residential replacement sales receive a boost from increasing existing home sales. Some 10.0% of homebuyers invest in new flooring over the first year of ownership, replacing an estimated 120 square feet of flooring per existing housing unit sold. Despite a better outlook for the fourth quarter of 2009, floor coverings square foot sales are estimated to drop by a total of 15.1% for the entire year. This is a sharper rate than the 13.7% decline recorded for 2008. However, if existing home sales levels continue to rise in 2010, Catalina expects U.S. floor coverings to begin to recover in the second half of 2010. Floor coverings sales are estimated to decline by 3.0% to 4.0% in the first half of 2010 as declines in the builder and nonresidential markets continue to drag down overall industry demand. However, as the overall U.S. economy begins to recover over the next few quarters, Catalina sees floor coverings square foot sales rising by 5.0% to 6.0% in the second half. This could cause total sales to rise by 2.0% in 2010. These trends assume interest rates remain at relatively low levels, despite the Federal Reserve pulling back some of their monetary stimulus, and inventories of new and existing homes trend downward so home prices could begin to stabilize. What have you observed in your business? 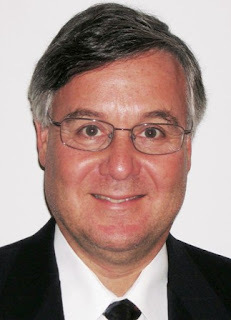 Hello, I am Stuart Hirschhorn, founder and director of research for Catalina Research, Inc. I am also a consulting member of the Floor Covering Institute so you will be hearing from me periodically on this blog. Today I want to share some Catalina floor covering research that points to an upturn in the U.S. floor covering market in the second half of 2010. This forecast is based on an upturn in existing home sales in recent months. Since some 10% of homebuyers purchase new flooring within the first year of ownership, the upward trend in existing home sales could show up in rising residential replacement sales next year. As many of you know, Catalina publishes the Floor Coverings Industry Reports and the Floor Coverings Quarterly Update. The following information is an extract from the most recent Catalina Floor Coverings Quarterly Update released in September 2009. The decline in U.S. floor coverings square foot sales (shipments minus exports plus imports) continued at relatively sharp rates in the second and third quarters of 2009 (see chart). However, the rate of decline improved somewhat from the first quarter plunge. In the second quarter of 2009, square foot sales declined by 15.3% and sales are estimated to drop by another 14.9% in the third quarter. 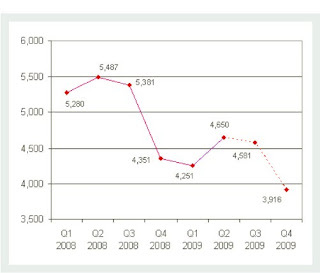 This compares to a revised 19.5% decrease in the first quarter of 2009. Based on these trends, the fall off in square foot sales during 2009 will be worse than the drop in 2008. The sharper decrease in floor coverings square foot sales during 2009 is due to the continued contraction in residential markets and the weakness spreading to nonresidential markets. In the private residential construction market, spending declined by one-third in the first half of 2009, versus a 29.0% drop for all of 2008. Meanwhile, the contraction in housing starts accelerated during 2009 as foreclosure and unemployment rates rose. In addition, the homes that were completed were smaller and sold at a lower cost. This further reduced sales to the builder market. The estimated 9.0% decline in private nonresidential construction spending in the third quarter of 2009 added to the downward pressure on floor coverings sales. The decrease in this market was due to the nearly 19.0% decline in corporate profits in the first half of 2009. The downturn in nonresidential markets over the next few quarters may be as steep as the one seen in residential markets a year earlier. Government purchases is currently the only market providing growing sales opportunities during 2009. The decline in floor coverings square foot sales is occurring in all industry sectors. However, consumers have shifted their preference for lower-cost flooring. In the first half of 2009, carpet and area rugs, resilient flooring, and laminate flooring either increased or held onto their share of total industry sales. These are also the industry’s lowest-cost product lines, especially on an installed basis. Ceramic tile suppliers changed their product mix to take advantage of this trend in the second quarter of 2009. During this period, ceramic tile manufacturers and marketers cut average prices by 10.2%, allowing them to regain some lost market share. On the other hand, wood flooring continued to lose ground in the second quarter for this relatively high-priced flooring material. The question now facing the industry, is there any light at the end of the very long dark tunnel of declining U.S. floor coverings sales? If there is, it is showing up in existing home sales trends, which influences floor coverings’ most important end-use market, residential replacement sales. Existing home sales are estimated to rise by 4.8% in the third quarter of 2009 over the same period of the previous year. This compares to a 2.8% drop in the second quarter, a 7.4% decrease in the first quarter, and a 13.1% decline for all of 2008. Catalina estimates that existing home sales could rise by 5.0% to 10.0% in the fourth quarter of this year. The turnaround in existing home sales is due to increasing housing affordability as average home prices and interest rates declined and government programs to stabilize the housing market, especially the $8,000 first-time buyer tax credit. These positive trends could result in a healthier floor coverings retail market in the third and fourth quarters of 2009, since some 10.0% of homebuyers invest in new flooring in the first year of ownership. We may already be seeing early signs of this trend at specialty floor coverings stores. In July 2009, specialty floor coverings store sales decreased by 16.9%. However, this is an improvement from the 19.7% drop experienced over the first half of 2009. The improvement may be tepid, however, it is the first significant sign that the contraction in the U.S. floor coverings industry may finally hit bottom. This is great news for an industry that has seen sales decline by 10 billion square feet over the past four years, or a drop of 37.8% from peak demand in 2005. End of Part 1. Look for Part 2 of "Outlook for the U.S. Floor Covering Industry" on Thursday, October 8th. I have just returned from a whirlwind, nine-day, 11 factory tour of China, traveling from Shanghai (east) to the Tibetan Plateau (west), from Weihai (north) to Hong Kong (south) and points in between, seeing more people and buildings than most Americans can imagine. I’ll be posting here and publishing articles over the coming months about the opportunities I see for floor covering and China’s market economy. So stay tuned. Even though I have been traveling to China for nearly 20 years, this trip was eye opening. While the world is mired in the worst recession in 75 years, China continues to grow. Building cranes abound, not one or two but hundreds in every city I visited. Massive high rise housing projects are rushing to meet the demand of the largest rural to urban migration in the history of the world. Their skylines stand testament to western forecasts that by 2015 roughly half the world’s construction will take place in China, and by 2020 their construction boom will exceed 200 billion square meters. Of course, the fact that every new floor is an opportunity to sell floor covering was not lost on me. 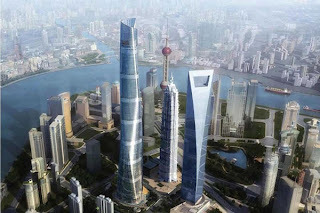 about Pudong’s Lujiazui district and will be the second tallest building in the world. Equally fascinating is the size and configuration of China’s floor covering industry, product categories, market share, channels to the consumer, manufacturing methods, product innovation, imports vs. domestic production, and so on. They are both the world’s largest exporter and the largest importer of many different products. Their burgeoning market economy (a topic in and of itself for a later post) cannot be ignored and demands the attention of every forward thinking businessman. Buyers and sellers take note - this region presents incredible opportunities for imports, partnerships, mergers and acquisitions. If not you, someone else will meet that call. Stay tuned as I share more specifics about this trip and the Chinese markets and opportunities. Meanwhile, send me any questions or topics of interest you might have about China via email at jgould@floorcoveringinstitute.com.